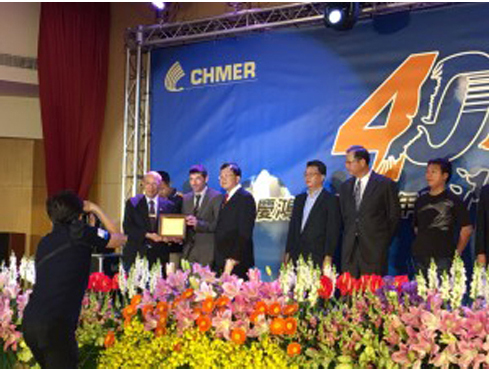 Last November 24th, Chmer (Taiwan) celebrated their 40th anniversary and Fagor Automation was awarded as one of the best suppliers. Fagor Automation and Chmer partnered up more than 15 years ago and continue to strive for excellence and flexibility toward supplying the end user with the latest technology in today’s ever changing industry. Their R&D department has developed a highly reliable and user friendly CNC and their software department has also developed specific EDM software to optimize cutting performance between the power supply and the drive besides providing a specific user software (interface) for special applications. The 40th anniversary celebration took place in Taichung with the attendance of 250 people among their 40 main suppliers and other guests. Mr. Wang (Chairman of the Board of Chmer) handed out the awards and our colleague Dr. Jose Emilio Oti (Feedback and DRO sales manager for that area) was one of the fortunate ones receiving such award.